My last day in Vegas started with a bang. I walked outside and found a picket line in front of my hotel. I went over and talked to the Union leaders conducting the event. 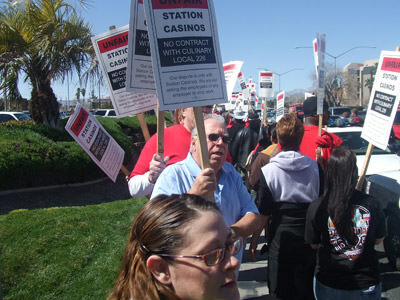 They told me there had been indiscriminant firings of culinary workers and that the Station Casinos refused to negotiate a contract. They gave me a picket sign and I gave them an hour of walking the line. I was able to get in my daily exercise and help my fellow union brothers. It was good to be doing union work again. I drove over to the Rio Casino and got into a poker tournament. I know, I know, I said I was only going to play in live action games but I had to give tournament play one more shot. I made the final table and we got down to only four players. The Casino only paid the top three places. I went all in with a king queen and my opponent had the same hand. The five cards on the table did not match our cards but four of them were hearts. I had no heart. My opponent had a king of hearts. I was out. I missed a payoff by one place. It may have been bad luck but I again thought I heard the evil cackle of a gremlin. I will be back in June to try again. I ended the night at the Bonker’s Comedy Club watching the Coasters do their show. 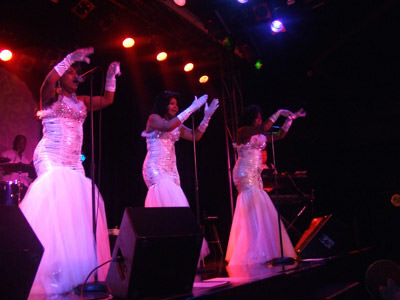 They have a great act and those beautiful Sensation girls made my eyes fill with tears when they sang, “Dedicated to the One I Love.” They were superb. It was a fun time but I am ready to hit the road again. Adventure beckons. 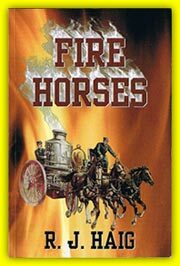 The Firewriter helps his union brothers and sisters.